Summertime means peaches! Peaches galore. I’ve seen peaches exploding all over the place from Georgia, where I live, to Sonoma and Napa counties, California, where I just visited. I’ll be doing some entire posts on the gorgeous food possibilities in California, but for now, let’s focus on the peachy abundance of Georgia. This area is known for its peaches and pecans. You may have seen them heavily featured in recent recipes because why not? Delicious and beautiful and healthy and local. What else could you want? Now… I’ll be honest. 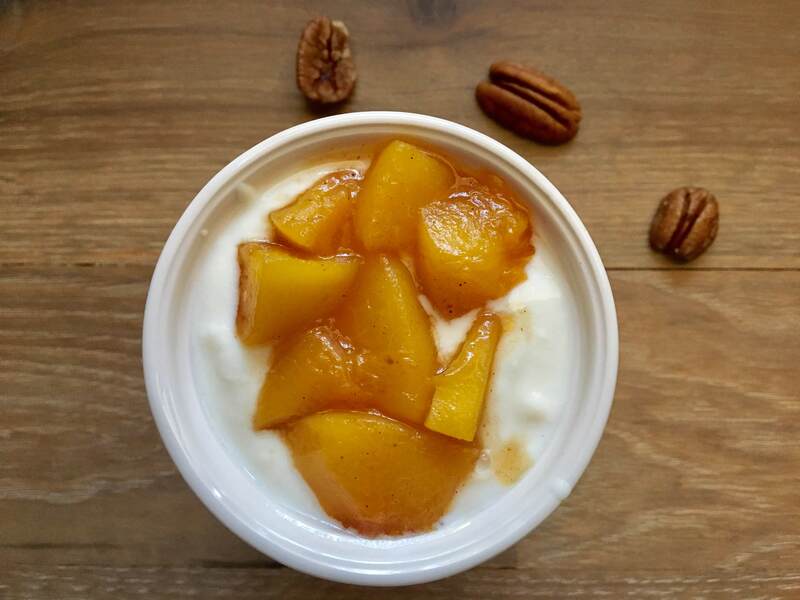 This peach compote was not made from Georgia peaches. Even though it’s summer! Why the freak not? Because I caved in the wintertime and bought a bag of frozen peach slices. Usually frozen fruit is great. My favorite fruits to get frozen are sliced strawberries, wild blueberries, and cut-up mango pieces. However, this bag of peaches did not perform the way frozen fruit usually does. But, I couldn’t in good conscience throw them out, so they hung around in the freezer awaiting fresh inspiration. And as I ventured down my vegan yogurt explorations, I wanted to find ways to add more fruit. My eyes spied those sad frozen peaches in the bag of the freezer and I decided to see if they could come back to life in a compote. Compote is such a pretty word, isn’t it? It sounds so proper, poised, and fancy. In truth, it can be all of those things, but it’s also incredibly simple and inexpensive. Traditional compote involves cooking fruit in a syrup or with sugar… but I decided to just skip that part. The result: golden, glowing, peachy, deliciousness that is pure and clean. Add this tasty compote to granolas, yogurt, smoothie bowls, or sneak a little spoonful here or there for a little pick-me-up! This glowing, creamy compote is the perfect accompaniment to vegan yogurt, granola, or other breakfast items that benefit from a bit of peachy accent. Add peach slices, vanilla extract, Chinese 5-spice, lemon juice, and 2 tbsp water to a small saucepan heated to medium. Stir the peaches often as they cook down and continue to add more tablespoons of water as the water evaporates. Continue cooking for approximately 5-10 minutes until the peaches are soft and tender. Taste and adjust spices to preference. Fresh peaches will cook faster than frozen peaches. Substitutions for vanilla extract can be vanilla spice or vanilla paste from whole vanilla beans. Chinese 5-Spice is a mixture of star anise, fennel, cinnamon, cloves, and black pepper. This is available for purchase in most grocery store spice aisles. Substitute 1/4 tsp cinnamon and 1/8 tsp of nutmeg if desired.